Growing up in the 80’s we were all witness to the booming action genre and no star was bigger than Arnold Schwarzenegger. The Running Man, Commando, The Terminator, Red Heat, but my personal favorite was Predator. There was a sequel, the less favorable Predator 2 and the 2010 Predators starring Adrian Brody. 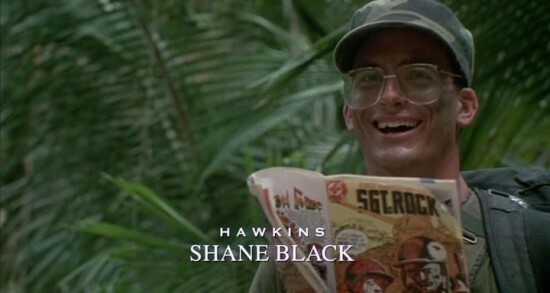 It’s been a while since we last heard about the new Predator movie that Shane Black is attached to direct, but we’ve got some good news: it’s still very much moving forward. The Kiss Kiss Bang Bang & Iron Man 3 director signed on to direct and write a treatment for a new Predator movie last summer, enlisting his friend & Monster Squad co-writer Fred Dekker to pen the screenplay. Collider reports that, while initially reported as a reboot of the original film, Black—who appeared as an actor in the original and also contributed significantly to the script—subsequently revealed that the film is instead an “inventive sequel” that will mine the rich mythology of the franchise. It’s still unclear if this will be Black’s next film though. He’s developing the 1930s-set adventure pic Doc Savage and the Remo Williams adaptation The Destroyer at Sony Pictures, and he’s also has months before the release of The Nice Guys so he may not settle on his next film until early next year. I for one will be pulling for Black’s Predator sequel to be next on his plate, until then I suggest everyone “Run! Get to the chopper!” & let us know how you feel in our comment section! This entry was posted in Breaking News, Film and tagged Predator, shane black. Bookmark the permalink.